With 10 goals in four games, the state’s leading goal-scorer through the opening two weeks certainly knows how to put the puck in the net. But not many people outside the northwest corner of the state are familiar with Detroit Lakes junior forward Tanner Lane. Lane opened the season with a six-goal outburst as Detroit Lakes rolled past Becker/Big Lake on Friday, Nov. 27. In his most recent game, the big junior tallied a hat trick, but the Lakers fell 5-4 to Fergus Falls in a Section 6A battle Saturday, Dec. 5. Lane's 10 goals and eight assists through four games give him 60 goals and 54 assists for 114 points in just over two full varsity seasons. With 10 days off until the Lakers’ next game, The Breakdown conducted an interview with Lane about his season and the Detroit Lakes program in general. Breakdown: Detroit Lakes isn't known as a hockey power, yet you have remained with the program and are excelling as a player. Tell me about the decision to stay at DL and what that means for both you and the program. Lane: Staying here in DL was my first choice by far because there’s nothing like playing with your buddies and playing in front of your town. DL may not be considered a power, but just playing in the State of Hockey is giving me exposure, and of course playing in (Upper Midwest) Elite League and Select festivals helps. Coach Denardo is also a good reason for me staying because he is such an organized coach and is helping me develop into the best player I can be and that is benefiting me big time. Breakdown: What is the outlook for Detroit Lakes hockey this winter? Little Falls lost that big senior class...does that open it up for other teams like the Lakers? Lane: Our team has really matured over the off-season and I wouldn't be surprised if we were going deep into the playoffs; contending for the section title. Breakdown: Give me a short scouting report on you as a player. What are your strengths on the ice? Lane: I would say my strengths are being able to see the ice and create plays with the people around me and my ability to handle the puck. Lane: In the off-season I just mainly like to get as much ice time as I possibly can. I also go to the weight room mainly to just stay in shape and get stronger. Breakdown: I imagine you've been contacted by different hockey programs about continuing your hockey career beyond high school. What has that process been like? Lane: It has been really exciting. It has been my dream since I first started hockey to be able to play DI or anything like that. Now that I’m at the stage now where it possibly could become a reality, it’s extremely exciting and it inspires me to drive more and more so that I can get the chance to make my dream come true. Lane: I’m very superstitious. I have to do all my stretches during pre-game warm-ups in the same order, or else it throws me off. Breakdown: Besides playing high school hockey, what other activities/sports/etc. are you involved in? Lane: I play golf in the spring. Golf is a great sport that I enjoy a lot. 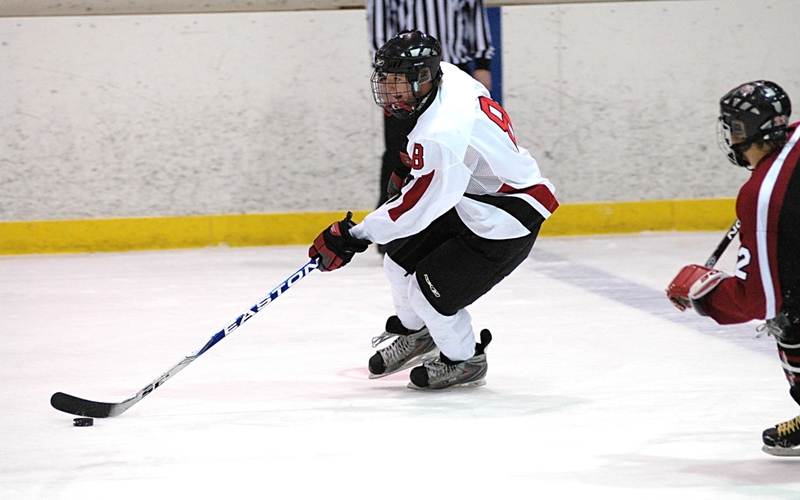 Lane: My favorite hockey memory would have to be playing in my first varsity game. I was so nervous but excited and we won 5 to 2 and I got my first goal. Breakdown: This is the cliche question, but what player did you grow up following for style of play? Lane: I loved watching Peter Forsberg. He had physical dominance but at the same time he had the hands of a dangler. I like to try to have the same type of playing style as him. Lane: The best part of high school hockey is just being able to play with your buddies and working hard every day for the same thing, and of course, the great student sections at each game that make each night intense. Tim Kolehmainen, The Breakdown editor, can be reached at tim@mnsportspreview.com.